On Barsoom, he encounters a race of tall, four-eyed alien creatures known as Tharks and led by the warrior Tars Tarkas (Willem Dafoe), who has witnessed Carter’s impressive new abilities and believes he can be a great asset to the ongoing struggle of the Tharks. Tars and most of the other Tharks, particularly Sola (Samantha Morton), accept Carter as one of their own. They witness a mid-air battle between Sab Than (Dominic West), the “jeddak” (king, or ruler, or something) of the warring Zodangans, and Dejah Thoris (Lynn Collins), a princess of the Barsoom city Helium and a scientist whose father Tardos Mors (Ciaran Hinds), the jeddak of Helium, has arranged for her to marry Sab in order to broker a peace between Helium and Zodanga. Ever since gaining control of a weapon known as the Ninth Ray Sab has become the most powerful warlord on Barsoom, but Dejah believes the power of the Ninth Ray can be used to bring Barsoom back to its once-glorious state. During the battle Carter rescues the princess and the two of them become infatuated with each other. Dejah agrees to help Carter get back home but he comes to understand that he may be the last best hope for Helium to defeat Sab Than and finally bring peace back to Barsoom. In order to best the might of the forces of Zodanga, Carter must unleash the hero within and he’ll need the help of the Tharks. Pulling Sab’s strings is the enigmatic Matai Shang (Mark Strong), the leader of an eternal race of shape-shifters called the Therns with his own devious plans for Barsoom… and Carter’s home world. The John Carter of Mars pulp novel series created by Edgar Rice Burroughs is by and large the Rosetta Stone of geekery. Burroughs’ legendary character has been the undisputed inspiration for countless generations of writers, artists, and filmmakers and many iconic creations of modern fiction, both in literary form and in the pages of thousands of classic comic books. Without John Carter there would be no Superman, no James T. Kirk, no Luke Skywalker or Han Solo, and no Neo. But the character has never been adapted for the big screen until now, exactly one hundred years since the serialized first Carter adventure was published in book form as A Princess of Mars, which Andrew Stanton‘s live-action directorial debut John Carter is mostly based upon. Many filmmakers from animator Bob Clampett to actor-turned-Iron Man director Jon Favreau have made valiant attempts to reconcile Burroughs’ vision with their own on the screen. It took more than seven decades for it to happen, and in that time the initial cinematic outing of the original sci-fi franchise has been lapped hundreds of times by the classic genre movies it influenced. Fewer movies will be released this year that seem like they weren’t merely made but rather willed into existence and painstakingly crafted into genuine entertainment as much as John Carter. This is a movie that despite its flaws (which I’ll get to shortly) bleeds passion, ambition, imagination, and excitement from its pores. It respects the source material while finding ways to update and expand Burroughs’ narratives beyond the printed page. This movie is pure fun. I love how Stanton and his co-writers Mark Andrews (the director of the upcoming Pixar feature Brave) and novelist Michael Chabon (Wonder Boys) tell the story from the perspective of Burroughs himself, portrayed here as a awe-inspired young man by Daryl Sabara (Spy Kids), in keeping with the narrative of A Princess of Mars. By inserting the actual creator of John Carter into the story the filmmakers shrewdly imply that Burroughs had some real-life inspiration for his amazing tales, much in the way Rudyard Kipling appeared as a supporting character (played by Christopher Plummer) in John Huston’s 1975 adaptation of the author’s classic story The Man Who Would Be King. The entire story is told by Carter in the form of a journal he bequeathed to his favorite nephew Edgar Rice Burroughs after he suddenly dies. Best of all Stanton and company use the wraparound story to great effect in John Carter. But once Carter reaches the planet of Barsoom the real fun begins. There are spectacular battles on great airships that recall Return of the Jedi, a sword-slashing melee between Carter and an army of vicious brutes that could have come from one of the late Frank Frazetta’s paintings, and wondrous visuals depicting fantastic Martian cities. Alien creatures are brilliantly realized by the film’s effects team. The Tharks are rendered using motion capture CGI and the actors chosen to portray the main Thark characters are all terrific and expressive in their roles, in particular Willem Dafoe as the noble, battle-hardened Tars Tarkas and Samantha Morton as the sweet but haunted Sola. Thomas Haden Church and Polly Walker fare almost as well as the treacherous Tal Hajus and Sarkoja respectively. None of the actors playing the Tharks are given the chance to truly shine the way Andy Serkis did last year in Rise of the Planet of the Apes, but they still do wonderful work. The humanoid denizens of Mars are also a mixed bag, but I truly enjoyed Lynn Collins as the beautiful and headstrong Dejah Thoris, looking lovely with red etchings on her skin and a fire in her eyes that would motivate any man to join her cause. James Purefoy, as Dejah’s brave fellow warrior Kantos Kan, brings mighty swash-buckling flair and great humor to his performance. Dominic West and Mark Strong both make for capable villains, but neither are able to adequately project the deadly charisma and menace of the greatest of classic movie baddies. Stanton’s greatest casting misstep is unfortunately his lead actor, Taylor Kitsch. 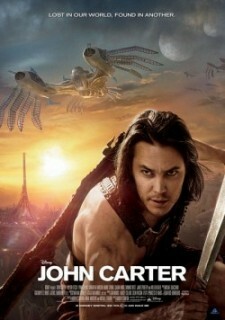 I’ve never been a fan of Kitsch’s acting and his performance as John Carter did nothing to win me over. It’s a perfectly serviceable performance as a man haunted by his past forced to fight for the future of Barsoom, but Kitsch never imbues his Carter with any sense of charm, wonderment, or loneliness. This is a role that demanded an actor with great talent able to make the character believable and sympathetic, and Kitsch just wasn’t the actor for the job. Being surrounded by infinitely more talented performers who make the most of their roles doesn’t help his attempt any either. The music score by Michael Giacchino is one I will listening to countless times in the years to come, a great piece of orchestral art that is often able to capture the magic and otherworldly adventure of John Williams’ early scores for Steven Spielberg. The cinematography by Daniel Mindel (Star Trek) and production design by Nathan Crowley (The Dark Knight) bring Mars to vibrant life and imbue the proceedings with color and mystery. I truly felt like I was on Barsoom in the thick of the great adventure, and that’s all I ask for when I go to see a movie like John Carter. John Carter isn’t quite the movie that it had the potential to be, but when it works it soars like few event films made these days. Even its imperfections work in its favor on occasion, coming off as a real film willing to dive headfirst into a great series of novels and embrace their passions and absurdities with magic and appropriate solemnity.